Happy Tuesday Folks! I can hardly believe we're in December and Christmas is just a few weeks away. I must admit, I'm starting to feel a bit overwhelmed, there's so much to do! The next couple of weeks are packed with various things for the girls - Christmas shows (school and dance), three school trips, two school discos and the usual after school clubs. I'd say so long to my social life but luckily its pretty non-existent these days!! 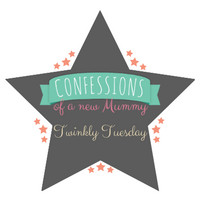 This week's Tuesday Twinkler is a post from Pandora and Max. Her eldest child has just finished school and headed to Thailand. The post is, to me, bitter sweet, a celebration of growing up and independence, for both Mum and child. I'm so glad these days are a while off for us (although I know they'll creep up and be here before I know it!). I'm chuffed! I have to admit that I caved and I messaged her on day 5. Anyway, she's home safe and had fun so all good! Then there was the 18th. That was a stress but I managed to single handedly run the kitchen, the drinks (clearing empties) and be security all by myself! No one had to go to hospital and no one threw up. So wins all round! (We did run out of beer & ice at one point but we have a bottlo down the road so that was easily fixed...). Now to focus on xmas...as you say, too many things on! Thanks for making time to be here during this busy time!